If you’d like to come experience life at Dancing Rabbit Ecovillage, consider applying for our Sustainable Living Visitor Program! In one of six sessions happening between April and October this year, you can join us in a one- or two-week deep dive into community, and learn eco-friendly skills and systems to take home with you. The many aspects of living a more sustainable lifestyle that you’ll discover here could change your life. 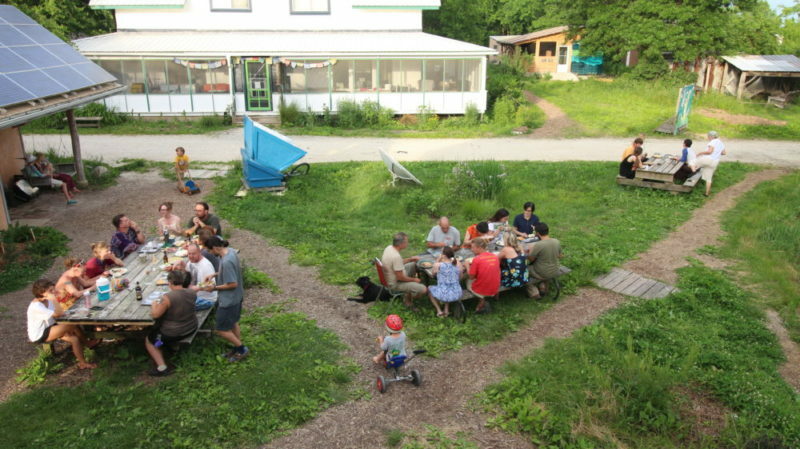 Would you like us to save you a seat at community potluck this summer? Take the plunge and apply for a visitor session now! Meet like-minded people while getting your hands dirty in the garden or working on a natural building. Stimulate your brain with high-quality authentic human connection, and unearth how you can co-create a sustainable future. Come away with a positive lasting impact on your relationship with yourself, other people, and the earth. Plus you just might discover that you too want to call this little patch of prairie home! Come live, learn, and play with the Rabbits of Dancing Rabbit Ecovillage. Besides all the workshops and work parties that happen during a visitor session, there are lots of ways to fill your free time. From song circles and Ultimate frisbee games to community potluck and drinks at the Milkweed Mercantile, to group meditation and qigong, or just hanging out and talking with like-minded Rabbits and visitors, there’s something for everyone. P.S. There are still a few special discount slots left – if you apply now you can get $200 off for the April 8 – 22 session!